If the data collection and communication model selected is based on health workers sending monthly alarm status and so-called "event" SMSs to the district, like in the Laos model this SMS communication should be included in the training programme. Most people can send SMSs but in order to get standardized and machine-readable data health workers must be trained in the expected syntax of the SMS. This might require extra exercises and more training time. Some examples of training material and exercises are included in the Related resources. For example in the case of the Laos pilot project, one SMS was sent at the beginning of each month by all health facilities, where the letter identified the refrigerator, the first digit was showing the number of heart alerts, the second digit the number of freeze alerts and then the quantity left of PCV and DTP vials. To start with, facilities were identified by the staff registered phone number but this was found too complicated to manage due to high turnover of staff and people changing their phone numbers. After a few months of trial, experience showed that identifying the health facilities with a 2-digit code at the beginning of the SMS was more practical. For facilities with multiple equipment a letter (A,B,C) was used as identifier for the specific equipment. For RTM, so-called "event" SMSs can provide immediate communication of a specific problem from the system itself but follow-up actions SMSs by health workers might be needed as part of the communication system and if the country opts for the integration of the SMS gateway into other health systems, the SMS syntax should be standardised. A communication table can help map the communication types and the roles and responsibilities of all the parties. An example is provided in the related resources section. This document shows an example of exercises for the practice of the syntax of (machine-readable) SMSs reporting when health workers send monthly SMSs to report on temperature alarms and stock levels to districts in the CCIS project in Laos. 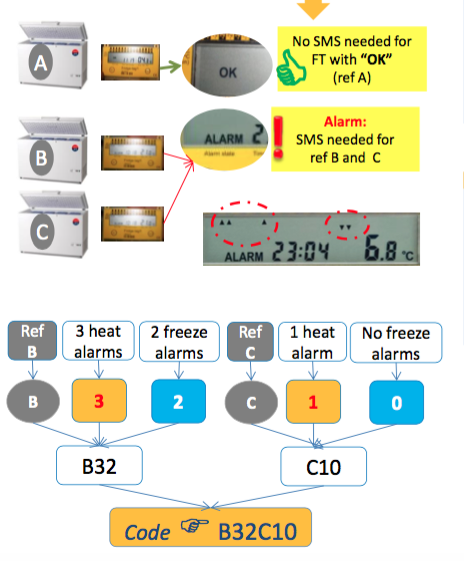 This document provides an example of the documentation for the parameters for SMS alerts in case of temperature excursion when setting up RTM. This document shows the different roles in the communication of temperature excursions and corrective measures. It is based on the Laos CCIS pilot project.